My mother, Mudder, as I affectionately call her, had an expression for putting someone back in their place when she perceived them as getting a bit too big for their britches. It fell along the lines of what Francis Schmidt, a football coach from Ohio State University, said in 1934 in response to a question about the team’s chances against rival Michigan, “Those fellows put their pants on one leg at a time, the same as everyone else.” Mudder’s version was a little more colourful, and involved a reference to one’s toilet habits. Needless to say, it drove the lesson home. At the end of the day, people are people. Regardless of title, people are still people. Regardless of status, people are still people. Regardless of race, people are still people. Regardless of…. you get the picture. We are taught critical thinking in the military. An aspect of critical thinking is going back to first principles when examining a problem, trying to erase bias and assumptions from the problem set. 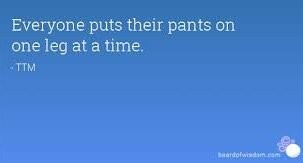 As that relates to interactions with others, I believe that remembering, “Those fellows put their pants on one leg at a time, the same as everyone else,” is the equivalent of first principles for dealing with people. Constantly reminding yourself that you put your pants on just like everyone else can go a long way to keeping your ego in check and keeping you humble. Conversely, remembering that your boss, peers, or subordinates also put their pants on just like anyone else can be helpful in your interactions with them. It can better enable you to empathize with a subordinate. It can help you view them not just as a worker responsible for a certain task, but rather as a human who suffers the same quirks, insecurities and challenges as the rest of us. It can make you take that extra second to pause before reacting. It can serve as a reminder to try to assuage a person’s anxiety or nerves at the start of a meeting or interview. It can mitigate the intimidation factor when prepping for a big presentation for your boss. It does not give you a license to be disrespectful of the position or title that people have earned, it just allows you to see them in a more human way – humanizing lenses so to speak. I’m reminded of an exchange I had with an American soldier who was participating with my unit in a Small Unit Exchange. This young soldier asked me, while shivering in -40C weather for the first time, what it was like to be a woman in the artillery. My response was “Do you like being cold? Wet? Tired? Carrying your body weight on your back?” He said, “Not really,” to which I replied, “Neither do I.” After that somewhat flippant answer which was said in good humour, I chatted with him for another twenty minutes or so, as really, he asked the question out of sincere curiosity. While there are things that I perceive differently than my peers because of my gender, at the end of the day, I put my pants on the same way as everyone else. Had this young man remembered that, he might have phrased his question in a slightly different manner or context. Mudder has provided me with many words of wisdom over the years. She always said that title, money, and possessions are not what define people. They are defined by how they treat others. We would all be well served to remember that regardless of title, people are still people, and we all put our pants on one leg at a time. I think it would have a positive influence on how we treat people. blood, but even our blood types differ. If you believe that the meek shall inherit the earth then you might want to ask “From whom ??”. Humility helps one empathize and understand other human beings. It facilitates the establishment of trust and without doubt, it is a pillar of leadership. It helps you answer the “woman in the Artillery” question in a humanistic way. It helps you accept the differences of the other’s cognitive capacity, personality, intelligence, ability, aptitudes and how they treat you and others. Some are born into humble surroundings while others have to learn humility. Humble people always seem to look for a level of humility in others. However, in the final analysis, I want the person I allow to lead me to have the competence to utilize my strengths to ensure our survival and the survival of those with whom we enter combat. At that moment I’ll probably not care too much whether the leader possesses a defined level of humility.